Another month, another subscription bag! I know that I usually do my Ipsy unbagging first, but I am currently waiting for that to get to me. I came home to an empty pink envelope (I assume someone took my actual glam bag) but Ipsy was kind enough to send me another! 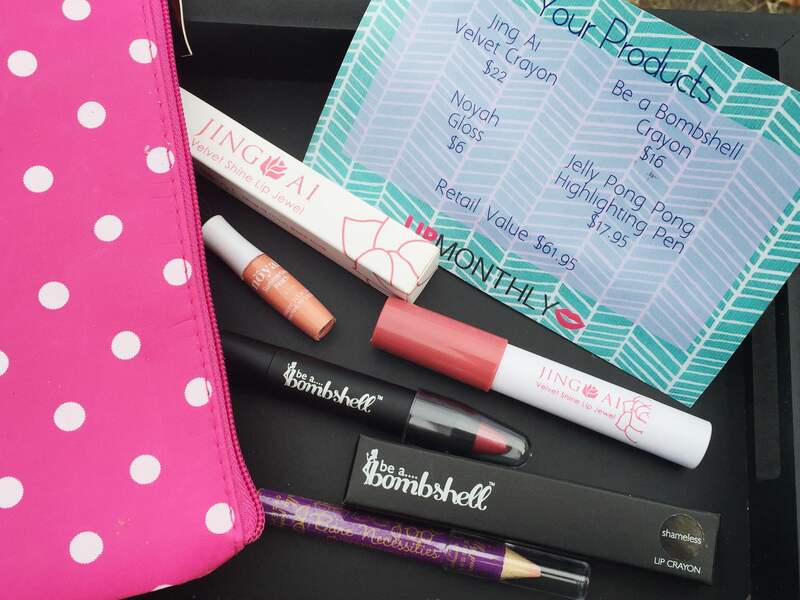 So, in the meantime, I will share what I got in my Lip Monthly bag this month! If you’re unfamiliar with Lip Monthly, they’re a beauty subscription that now costs $12.99 per month, but on average you get $50+ worth of stuff, and most of the products are full sized. This month I recieved 3 full sized items and 1 sample sized item. Jing Ai Lip Jewel in “Pink Star” $22 I’ve actually gotten one of these before in a past bag, but I am not unhappy to get another! These are actually really smooth and pretty pigmented for a lip crayon. I like when Lip Monthly sends these weird not as known brands because this is something I would have never thought to try myself, and it’s pretty awesome! Noyah Gloss in “Summertime Peach” $6 Okay, this item disappointed me. It’s a really tiny sample which always gets lost with my black hole of teensy samples, and peach just isn’t a shade I want right now. It’s not Summer anymore. I really hope next month we get some Fall things. There was a coupon code attached for 20% off though which was nice. Jelly Pong Pong Highlighting Pen $17.95 The last thing from Jelly Pong Pong I couldn’t really use, but this I might be able to. I like to use highlight pens like the Nyx wonder pencil to carve out my brows and highlight them, so that’s what I will use this one for! It swatched a really pretty peachy color and felt smooth, so I’m excited to try it! Be a Bombshell Lip Crayon “Shameless” $16 I’ve gotten a lot of be a Bombshell products from beauty subscriptions in the past, and I actually like their brand! I’ve been using the lip balm I got by them in an Ipsy bag for a few months now, so getting a new product to try is awesome. This is a really pretty berry shade that does remind me of Fall. 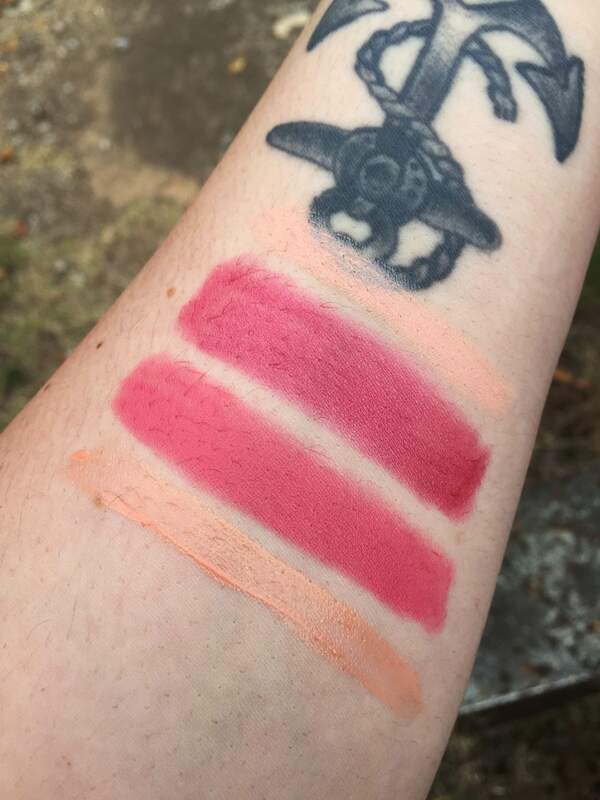 It swatched really smooth on my arm so we’ll see if it does that well on my lips! This was a really high value bag this month! Let me know what your thoughts are on this bag, and let me know if there’s anything you all would want to see a separate review on! As always, thanks for reading, and I hope you’re all having lovely days! Great review love!! I really like the Be A Bombshell crayon because I love that color! Looks amazing! Think I’m going to sign up. I’ve really enjoyed them so far, personally! I had a few problems with them the first few months I was subscribed, but lately they seemed to have upped their game! It’s a really really pretty color and I kind of want to try some more from them now!